For most of the mid to late 6th century BC, Athens was under the rule of the tyrants Peisistratos, Hippias and Hipparchos. During this period, the monetary system in Athens consisted of exclusively silver coinage struck in three denominations beginning about 545 BC. The drachm was the basic unit of value with its double (didrachm) and half (obol) providing a small complement of denominations. The design was quite crude simply employing a 4 spoke wheel. The reverse was merely a 4 chamber incuse punch. Sometime around 525 BC, the designs were changed. The didrachm displayed an Amphora while the drachm bore the simple design of a hindquarter of a horse facing right. In both cases, the reverse was still only an incuse punch of indistinct form. Prior to 515 BC, the didrachm began to display the head of a gorgon. The reverse bore a tiny head of a panther within the incuse punch. This is the first attempt at using the reverse side of the coinage in Athens. About 515 BC, the monetary system of Athens began to evolve further with the addition of a new denomination – the tetradrachm (4 drachms). With the addition of this new larger denomination, one can clearly see that inflationary pressures must have existed. The economy of Athens had obviously been expanding. The design of this new denomination seemed to retain the head of a Gorgon. The reverse, however, began to take full form. At first a facing bull’s head appeared within an incuse square. Later, the panther appears also facing and within an incuse square. The revolution and the birth of democracy in 510 BC was reflected in the coinage of Athens as well. 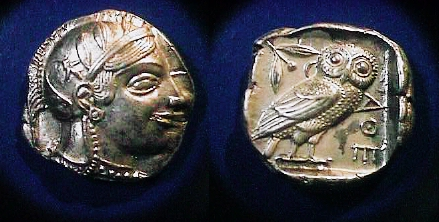 This was the occasion for the introduction of the famous Athens “Owls.” These new designs bore the portrait of Athena wearing a helmet. The reverse displayed her favorite pet – the Owl depicted in legend. Between 510 and 505 BC, it would appear that the only denomination struck with this design was the tetradrachm. 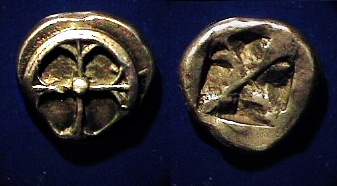 During the second decade of the 5th century there was a very large output of these coins which coincided with the discovery of vast silver ore at Laurion. It was this vast new wealth which enabled the Athenians to become a new naval power in preparation for war with Persia. 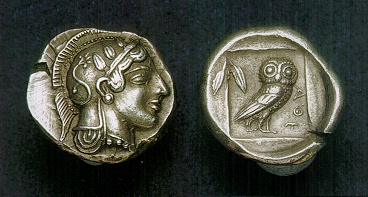 The Athenian Owl designs began to appear in smaller denominations between 505 and 490 BC. 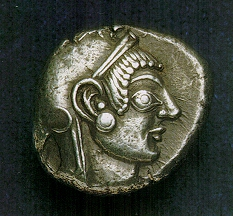 It is during this period where we find drachms and hemidrachms (¼ drachm). The refinement of the Athenian design was underway. However, it would take more than 20 years for the workmanship to bloom. 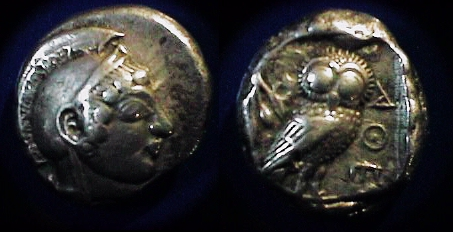 I not until 479 BC with the defeat of Persia and the rise in power and prestiege of Athens within the Aegean World do we find the designs of her coinage taken on a more refined style. We also find a very rare issue of the dekadrachm (12 drachms) issued around 467-65 BC. The refinement of the artistic design for the coinage continue. By 455 BC, the basic structure of the design in its most commonly recognized form began to appear. The reverse design was deeply incuse giving it a wonderful richness and feel. We also begin to see smaller denominations appear once again namely the didrachm, drachm, obol and hemiobol.